A: No. At the present time, we have over 30,000 WWII, Korea & Vietnam Era Veterans on our national waiting list and thousands more who will apply. It is doubtful that we will get to every deserving veteran in time. 100’s of Veterans have passed away while patiently waiting their turn. Hundreds more will not live long enough to visit their precious memorial. Can you imagine how long the waiting list would be if we added non-veteran spouses to our waiting list? The only spouses that are permitted to go are those who are veterans themselves (of the same era as their spouse). Q: I am the widow of a WWII Veteran. Can I go? A: Sadly, the answer is “no”. Again, we simply do not have the resources, funding, or seating available to transport all the WWII, Korea & Vietnam ERa Veterans who are presently on our national waiting list. Adding spouses and widows simply isn’t an option for our program. A: The cost is FREE for Veterans (unless you are going as a guardian). You do not need to bring any money, unless you intend to purchase souvenirs. Of the disabled veterans going, how many will have to be physically carried on and off the bus? Which guardian applicants are most qualified? Medically trained, active duty military personnel and veterans who have previously participated in a flight are given top priority and serve as leadership members. The applicants physically capable of assisting in the lifting of Veterans are also a top priority. Once the director feels enough of those positions have been filled, other applicants are then considered. Again, these decisions rest solely with the Program Director. 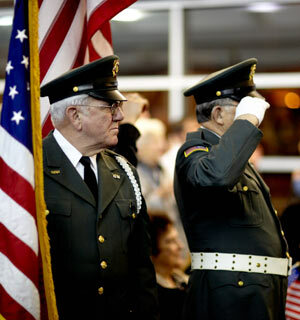 Q: As a Veteran, do i have to provide my own guardian before signing up for an Honor Flight? Absolutely NOT, we have literally hundreds of qualified people signed up to be your guardian! A: Honor Flight gratefully accepts donations from anyone EXCEPT Veterans (until after they have taken an Honor Flight). We feel that Veterans have given enough. This is our way of saying “Thank you”! A: Veterans are flown on a “first-come, first-served basis (determined by the application’s receipt date).” Within the applicants, top priority is given to WWII Era Veterans and all other veterans with terminal illness. Our second priority is to Korean War Era Veterans and then Vietnam Era Veterans. A: WHEELCHAIRS — About 30% of the veterans we have been transporting over the past three years have been in wheelchairs. Our deluxe motor coaches are ordered based upon this fact. Many of our coaches are equipped with wheelchair lifts. If there is a possibility that a veteran may need a wheelchair during one of our trips, we will provide it for them. OXYGEN — If the veteran requires oxygen, a prescription for the oxygen must be provided by the veteran’s healthcare provider, identifying the delivery method (mask or nasal cannula), frequency (as needed or continuously), and the rate of delivery (2-3 liters per minute). Honor Flight will provide an FAA approved oxygen concentrator for use during the trip. We also provide oxygen cylinders to be used at the memorials. If an overnight stay in the DC area is required, we will provide an overnight concentrator to use in the hotel room. Veterans on oxygen are required to have oxygen cylinders available from their home to the departure airport and also on the return from their local airport back to their homes. No oxygen cylinders are permitted to be used on the aircraft. If the veteran requires oxygen during the trip, please call us at (715) 573.8519 to discuss arrangements. Q: Are terminally ill WWII Veterans given any special priority? A: YES! Such veterans go to the top of the list for the next flight departing to Washington DC as part of our TLC Program. Not only are WWII Veterans given this top priority, but any Korea or Vietnam Era terminally ill Veteran, who has never been able to visit their memorial, are given the same priority under our TLC Program. Q: How can I start an HFN Hub in my part of the country? 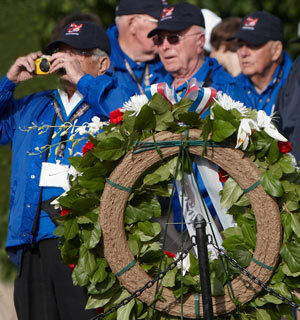 A: Throughout the United States there are several programs that operate in conjunction with Honor Flight. The individual program directors are part of a partnership called the Honor Flight Network. This governing body establishes general protocols, policies, credentialing, and maintains a national website and oversight of several programs. Q: Are the trips only for veterans who were in combat? A: Absolutely not. 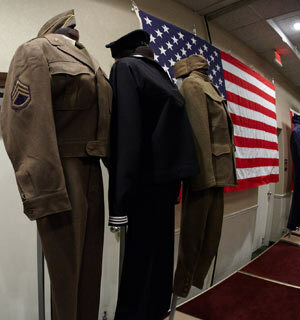 We wish to honor anyone who served in the U.S. armed services during World War II, Korea or Viet Nam eras. You do not have to have been in combat to qualify. (Approximately 1 of 11 veterans saw combat in WWII, Korea and Vietnam).